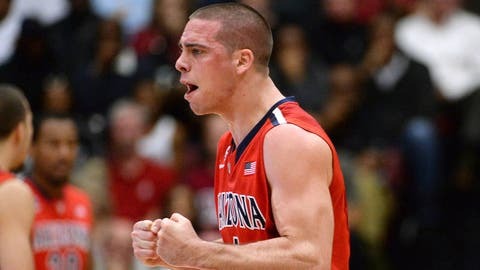 Arizona guard T.J. McConnell and the rest of his teammates can celebrate after a narrow win over Stanford. For nearly 9 minutes, Arizona made defensive stop after stop. In that critical sequence, the top-ranked Wildcats held Stanford scoreless and helped preserve their perfect start to the season. After a 3-pointer by Huestis with 10:03 remaining, Stanford didn’t score again until Powell’s layin at 1:21 — and Powell missed two free throws at 4:36 that would have put his team ahead.